Depression meets determination in this simple story as one woman fights to keep her job over a single weekend. The Dardennes brothers returned to the Cannes Film Festival directing Marion Cotillard in a heartfelt and political, but ultimately frustrating drama. Cotillard plays Sandra, an ordinary woman who suffers from debilitating depression and as a result, has taken time out from her job to try and get better. Just as she is expecting to return to employment, she gets a call stating that her co-workers have voted to each receive a bonus if Sandra is made redundant. With accusations that her foreman influenced the ballot, Sandra is given the weekend to try and persuade her friends and fellow employees not to vote to take their promised bonus, and instead vote to let her keep her job and help provide for her family. Sandra has a supportive husband and two children but each of the people she tries to persuade has their own issues, problems and excuses. Times are clearly tough and Sandra's family are not the only ones with financial problems. As she goes around to speak individually to those who can decide her fate, she pops Xanax pills and must remain optimistic even in the face of rejection and her own uncertainty. Sandra wants nothing more than to give up but with the help of her husband she finds the strength to continue tracking down enough people to help create a majority in the second vote on Monday morning. The problem with this slightest of stories is that Two Days, One Night quickly falls into a pattern of repetition. Cotillard is rarely off screen and even with her typically impressive performance, the film struggles to remain fully engaging. Her conversations with co-workers cover necessarily similar ground, even if the outcome of these encounters is rarely certain. The people she meets with are unfortunately almost instantly forgettable; realistic and completely convincing, but far from memorable. There are some exceptions with one man's shame filled admission and outburst being notable and another woman's life altering decision being a highlight. Their responses to Sandra’s pleas are varied; from icy cold to warm and refreshing. Sandra has to weather all these contradictory reactions, while ploughing ahead with her mission and trying to keep her emotions in check and head held high; not an easy task for a woman suffering from depression. The Dardennes have an obvious political point to make and their message is clear from the start and then finally hammered home forcefully by the smart ending. The perverse decision to put Sandra's future in the hands of her hard up friends and fellow employees is unfair and a sinister tactic to ensure that the workforce are divided and conquered. It is symptomatic of the way modern workforces are treated, particularly those with few options for employment and who live in financial hardship. Sandra and her family will be forced back to social housing without her income but everyone else she meets is eager for their own bonus, whether it be to buy a new patio or to simply make ends meet. Though much of the story takes a predictable course, there is a neat little twist in the tale and a surprisingly optimistic note in what could have been a relentlessly bleak trip. At one point, the film strays into almost laughable cliché, but in many others it is very much like watching a slice of real life. The Dardenne brothers’ typically realist style means handheld camera provides an intimacy to the drama while the complete lack of a soundtrack, except for when Sandra and her husband rock out to the car radio adds to the understated performances. While Two Days, One Night has an admirable and potent political message to convey, as a narrative it is a bit like a depressing song on repeat, going round and round in circles and losing much of its power along the way. Dardenne fans will appreciate its rawness but even they may expect a little more from the French directors. 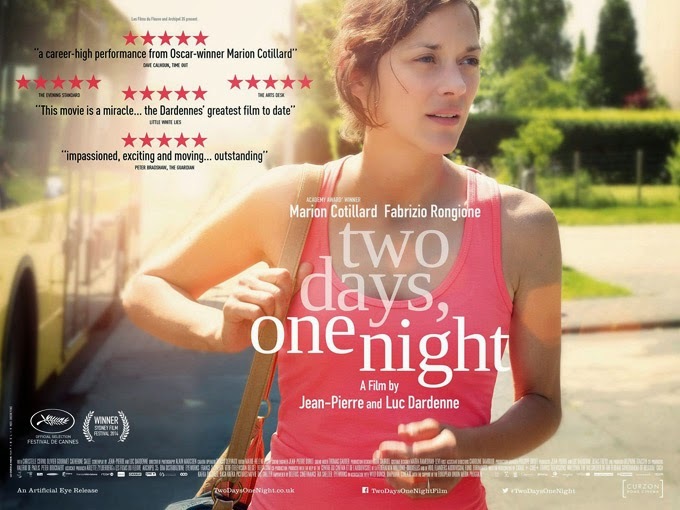 Like its central character, Two Days, One Night has plenty of potential but doesn’t always fulfill it.